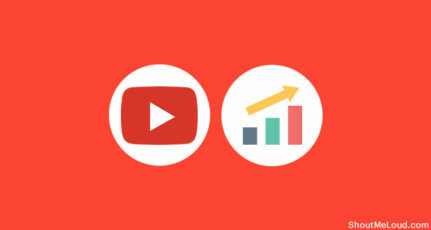 Do you have a YouTube channel and wondering how you can increase videos views on YouTube? If your answer is yes, read on to learn how to promote YouTube videos. The fact is, It doesn’t matter how much time you put into creating your videos; if you are not marketing & promoting your videos, your work will never be seen by the majority of your target audience. It’s like throwing a big party without letting anyone knows. And this is the time to change it and become one of the YouTuber who is seen by everyone. YouTube video promotion is an art which anyone can learn… with a little discipline. In this guide, I have shared strategies and techniques that you can follow to market & promote your YouTube videos. These tips are tested, proven, and work for videos from almost every niche. Think of this post as a checklist that you need to follow once you are done producing your videos. So without further delay, let’s learn the art of YouTube video promotion! I have covered all major YouTube promotion techniques in the sub-topics below. Note: In upcoming posts in our YouTube promotion series, I will explain these sub-topics in detail. If you are a professional YouTuber or are planning to become one, you should subscribe to our blog updates or download our iOS/Android app to stay updated. The titles of your videos are a major deciding factor between them being widely seen & shared across the internet, or only getting a small number of views. It’s a good idea to do proper YouTube keyword research to find what people are searching for and then crafting a great title around that. Keep them short and to the point. Add the current year if you can (Ex: Best Tips for 2018). Include keywords at the beginning of the title (where possible). Use “Power Words” (Ex: Best, Awesome, Incredible). Use emotional triggers words (Ex: Sensual, Lonely, Passionate, Censored). Capitalize your headline title. Use this tool to help you. One of the biggest mistakes that hinder the growth of your YouTube video’s organic promotion is incorrect tag usage. Tagging in YouTube works differently than it does in a blog post. If you’ve never paid attention to YouTube tags, now’s a good time to start. You can even go back and edit all of your old tags. Use your main keywords as the video tag. 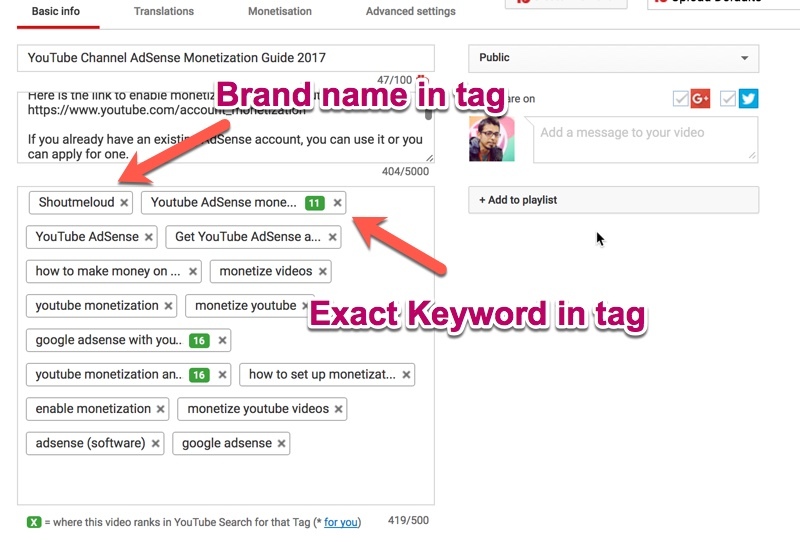 Use a variation of your keyword as a tag (take help of the YouTube auto-suggest feature). Find the tags used by high ranking videos & use those in your video. You can use the TubeBuddy Chrome extension to help you find tags used by others. Do remember, YouTube video tags are an important factor for the organic ranking of videos. Verified YouTube accounts can take advantage of the custom thumbnail feature. A good video thumbnail helps you stand out in the related video and suggested video section. Have a resolution of 1280 x 720 (with a minimum width of 640 pixels). Upload in either .JPG, .GIF, .BMP, or .PNG. Try to use a 16:9 aspect ratio as it’s the most used in YouTube players and previews. I don’t want to confuse you with these technicalities, but it’s important for you to know this so that you can craft a thumbnail that works well on desktops as well as mobile devices. You can use Canva or YouZign to design a thumbnail for YouTube videos in minutes. Have a resolution of 1280×720 (with a minimum width of 640 pixels). There are a few branding things that you should do from now on which will ensure every video stands out. One of those things is using a branded intro and outro. YouTube intro: A 3-5 second clip that runs at the beginning to showcase your brand. YouTube outro: This runs at the end and can be as simple as showing related videos for your channel or asking users to like & subscribe to videos. Getting a YouTube intro & outro video is easy, and you can create them yourself using Camtasia or you can hire someone from Fiverr. If you don’t have a channel logo yet, do get that designed, too. 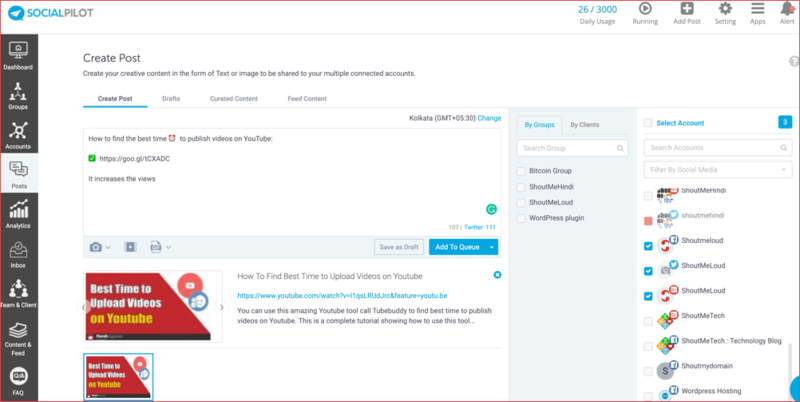 You can use a tool like SocialPilot to schedule videos to be shared on your social media channels. You can read about SocialPilot here. Always share your video after a regular interval. I typically share each video at least 10-15 times within eight months after publishing. Also, use hashtags when sharing so that others can easily discover them. If you are a full-time YouTuber, you shouldn’t miss out on creating a blog for your YouTube videos. These days, it’s pretty easy to embed YouTube videos onto a blog & you can start a blog. I recommend you to create a blog & use a video-specific WordPress theme. If you are already making money from Youube, It’s better for you to use Managed WordPress Hosting so that you don’t have to worry about blog maintenance. Bonus Tip: You can also buy a domain name & redirect it to your YouTube channel. This way when someone asks you “How can I find you on YouTube?”, simply share the domain name. Use this coupon from GoDaddy to buy a domain name for $2. A YouTube playlist is a great way to get more views on your existing videos. When you are done uploading a new video, add it to a playlist (either one you create or an existing one). Give a meaningful name to the playlist & have a keyword in the title of that playlist. Add a detailed description of the playlist and put your keyword(s) in there. Group similar videos into one playlist. A single video can be listed in more than one playlist. 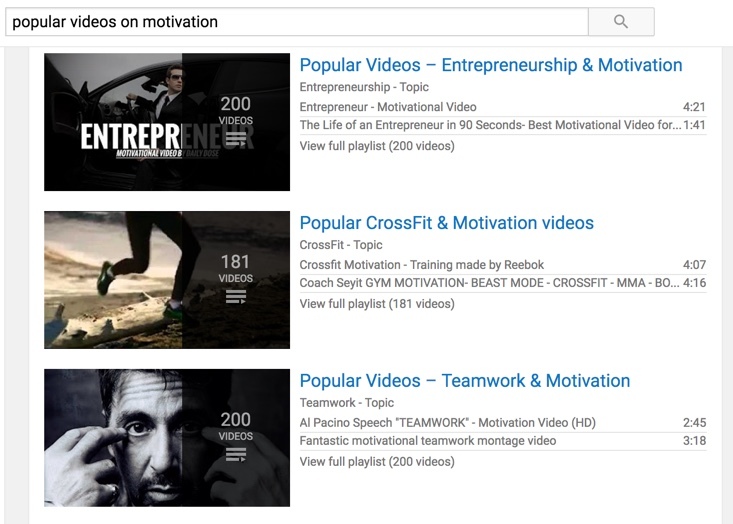 YouTube playlists also appear in search results. By doing this, further discovery of your videos is increased. People on social media sites need to be told about the actions you want them to take. At the end of the video, or even somewhere in middle, ask viewers to like & subscribe to your channel. At the same time, you can ask them to share the video with others who might benefit from it. Most of the prominent YouTubers use “Call to action” technique to amplify their video reach with existing subscribers. If you have never done this before, start doing it from your next video onward. You will be amazed to discover that by simply asking to your existing subscribers, the number of shares increases by a great extent. 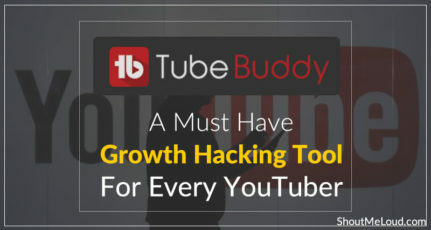 This one is not a direct YouTube video promotion technique that will boost your channel, and it fits perfectly in the overall strategy of your channel promotion. Interviewing an influencer gives you an opportunity to get access to an already thriving community in your niche. Not only you will grab the attention of others who follow that particular influencer, you will also get noticed by the industry as a whole. You can find the top influencers in your niche & you can interview them using Google Hangouts, Zoom or Skype. For Skype, you can use a tool like Ecamm call recorder. The free version of Zoom allows video recording of up to 45 minutes, which is what I use these days. One mistake most of the growing YouTube marketers make is they just focus on publishing more videos & stop learning. 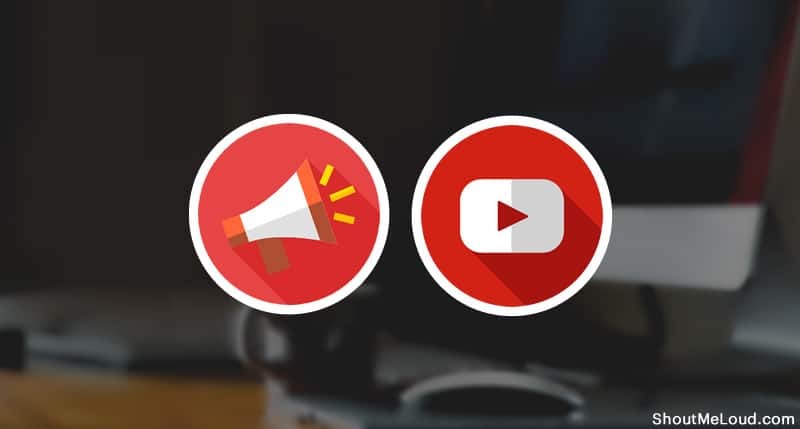 YouTube is one of the fastest changing platforms, and it’s important for you to learn about all of the existing and emerging tips and tricks. 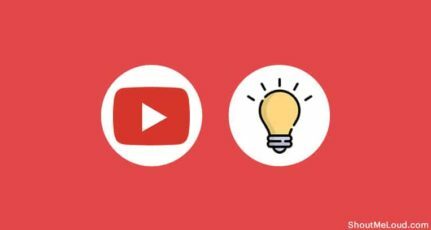 You can use Creator Academy by YouTube to learn some pro tips for making the most out of your YouTube videos (and your channel as a whole). When I started learning here, I was surprised to learn so many growth hacks & tricks which I would have otherwise missed. YouTube is silently building a social network and you can promote a video on YouTube by using the post to community feature. Simply click on the + icon on YouTube web or mobile app, and click “Create post“. Now, type the message and link to the video that you want to promote. You can add .gif or images or even run a poll to make it more engaging. Your community can like and also comment on your post which is a great signal for higher engagement. This is yet, one of the untapped free video promotion technique. Well, these are some simple promotion strategies & techniques that you can use from today onward for your YouTube videos. These tricks and tips will surely help you get a lot more traffic, and ultimately, more YouTube subscribers. 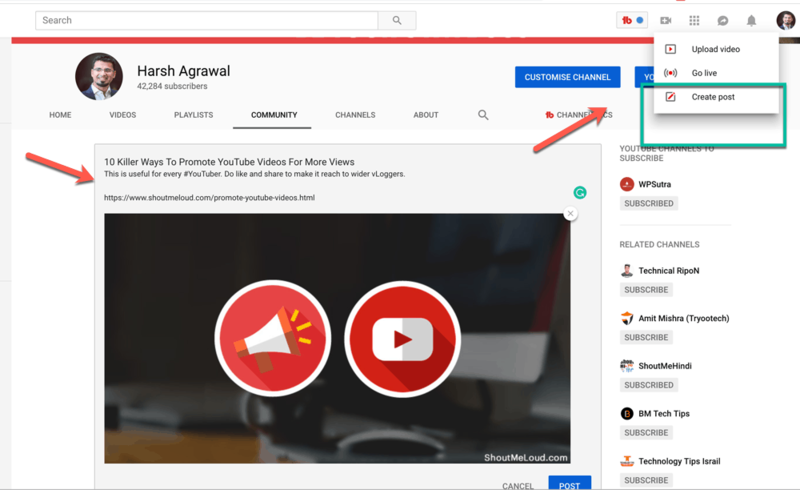 Now it’s your turn to share how you are promoting videos on YouTube after you hit the ‘publish’ button. Let me hear about your promotion strategies! I’ll keep updating this post with all of the best suggestions from the comments section. If you find any of the listed tips useful, share them with your YouTuber friends! And don’t forget to join me on YouTube! I have recently started youtube channel and now having 4K subscribers, this article helped me to understand the exact strategies of youtube. thank you for sharing the article i liked it. Hey, I m following all these techniques and really it worked for me. Now I am having more 7000 subs and 5 lakh views per months. Great article Harsh Sir, I had a dream to make my youtube videos go viral I love to work on Cricket Niche, I tried and failed tried again and failed for once more time.I always have a question in my mind “why my video is not ranking?” my struggle of the sleepless night working on Premier and After Effects gone in vain. After failed for 2-3 times, I left to work on youtube thought I will never get visitors on my channel. 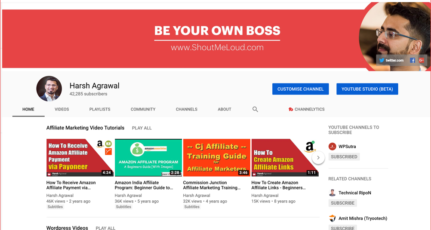 Your Blogging tips have helped me very much in blogging field and now it’s time to apply this trick & tips and youtube channel too. Thank you for this article Harsh sir.hope this time I will get succeed. Great post Harsh! This is very thorough. I will definitely follow this as I just started a Inspirational/Comedy Youtube Channel. I have found it easy to post the videos but tough to follow through to doing all the marketing aspects of promoting the videos. It is just something I need to just do it! These are all amazing tips to promote but I think the problem before that which comes in to picture is that whenever we feel like making a video we do make and upload them to the channel. There are a couple of things which goes wrong there and I believe that having them eradicated would bring much more result than not having them eradicated. 1) I have seen myself not looking at the lens than looking at how I look most of the time when I am making a video but that is not right and the video came out to be something like looking at the forehead of the person who will be watching the video. 2) Initially, when someone starts a channel it seems more than needed kind of action in the comments section of the video. That should not be the case and we should really be authentic as much as we could be. 3) Then is the youtube channel name being put in the video heading which is confusing and thereby not getting the traction I wanted. It makes sense after having an authority kind of thing but when I am starting out I made this mistake and my mistakes did cost me a lot of views because people were not able to figure out what my channel is about and they were confused. 4) Inconsistency which you have already explained in another article. I would not agree to have the frequency increased as it takes a lot of work to upload one single video in YouTube but to be consistent as to if you decide to put one in a week so be it but being consistent really pays off. 5) Finally, I would say that the ultimate thing that really matters is the quality and if it is not good enough then no one is going to watch anyway so no point having a video made if it is not making any sense or the AVL is not good i.e. Audio Video and Lighting. These are my learnings which I have come across and wanted to share my experience with what you have already shared. Cheers!